Nintendo has been talking about special themed attractions at Universal theme parks for quite a while, but a few days ago, the company finally made a proper announcement (complete with a video featuring Shigeru Miyamoto). It was revealed that Nintendo attractions were coming to Osaka, Orlando, and Hollywood. But unfortunately, we didn’t get many concrete details: what kind of attractions? Which Nintendo franchises and character? When will it be launched? 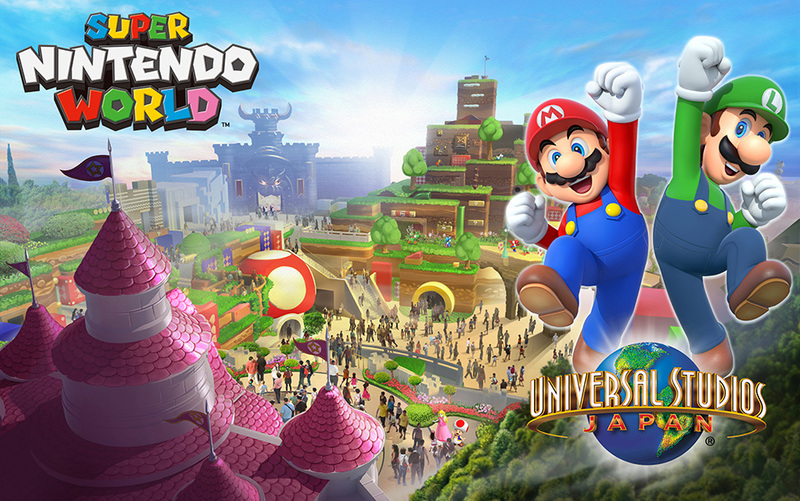 Today, Nintendo shared a few more details and a even a pretty neat visual for the Nintendo theme partk at Universal Studios Japan, which is to be called Super Nintendo World. Nintendo confirms that this Super Nintendo World at Universal Studios Japan will open before the Tokyo 2020 Olympics, which does fit with what we previously heard (not to mention that it makes a lot of sense to take advantage of such an important and international event for a theme park!). Also, it’s once again been confirmed that it would not be only about Mario: other popular Nintendo characters/series will also be featured. According to Nintendo, Super Nintendo Land will be comprised of “expansive and multilevel environments” featuring state of the art attractions, interactive areas, restaurants, shops, and more. The key visual above gives you a good idea of what everything will look like, and as mentioned the other day, it really does give you the impression of entering a game’s world. Since there are still over 3 years left before the Tokyo 2020 Olympics, it looks like we will have to wait a bit more before getting more details about Super Nintendo Land. Also, it’s not clear whether the Nintendo theme parks in Orlando and Hollywood will also be called Super Nintendo Land and be modeled the same way, or if Nintendo and Universal chose to go with three different designs. In the press release, it was revealed that this Super Nintendo Land represents an investment of over 50 billion Yen (about €410 million / $433 million / £344 million). According to the Kansai University, this will be more than worth it, as the theme park is expected to bring 6.2 trillion Yen to the Kansai region in 10 years (11.7 trillion to the whole country), with over 1 million jobs created.